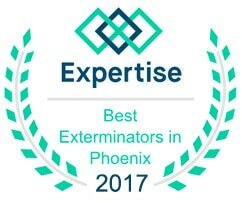 With over 8,000+ houses treated for bed bugs throughout Arizona, exterminating bed bugs is what we do best. Phoenix Bed Bug Expert offers 100% guaranteed bed bug treatments through through bed bug heat treatments and chemical treatments. Heat vs Chemical Treatments – What is the Difference? If you are looking for instant, same-day relief from your bed bug infestation, then the heat treatment is going to be the best treatment option for you. 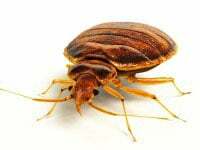 With the other option, a chemical treatment, bed bugs are only killed once they make contact with our pesticide. Any bed bug eggs that are unhatched must also make contact. This entire process can take up to 30 days. A bed bug heat treatment is the more costly treatment, but it does provide that instant, same-day relief that most people want. Whether you decide to go with a heat treatment or chemical/pesticide treatment, only one treatment is needed to get rid of your entire infestation. Our Priority Is To Keep You Bed Bug Free! We are not a general pest control company, we specialize in only eliminating bed bugs. We offer some of the best warranties and will always leave you bed bug free. With our experience with only eliminating bed bugs; we are able to correctly perform both types of bed bug treatments to give you guaranteed results. To halt the further infestation of bed bugs throughout your home, give us a call to set up an inspection and treatment. 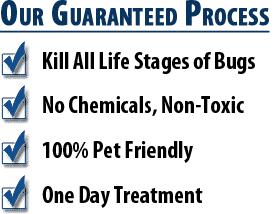 We are completely confident in our bed bug process and treatment services that we guarantee our heat treatment service for one year, and our chemical/pesticide treatments for up to 6 months.